The most devastating fires in California’s history are still burning at the Camp Fire in Northern California and the Woolsey/Malibu Fire in Southern California —yet already there is talk about changes in California laws regarding fire liability. While consumer advocates will struggle to revoke the utilities’ ability to pass on the costs of fires, it is expected that utilities will seek immunity to further limit their exposure to liability. Threatening to declare bankruptcy after PG&E was found responsible for previous fires, this utility company spent over $10.5 million dollars just last year lobbying the state legislature[i] with the hope of currying favorable laws. It is reasonable to assume their lobbying efforts are not at an end, and in fact, they will probably step up their efforts. In response to lobbying, earlier this year, the California legislature enacted Senate Bill 901. Unless amended, starting in 2019, this new state law will, under certain conditions, pass the expense of fire liability costs on to consumers and allow utilities to sell bonds to offset fire liability costs. While this new legislation won’t affect liability for the pending fires, it will give utilities a possible pass for future calamities. Before it even comes into effect, this new legislation should be amended to prevent utilities from passing the costs on to consumers. Preliminary investigation reveals PG&E utility’s role in triggering the pending Camp Fire. This devastating fire obliterated much of Paradise and devastated surrounding Butte County, resulting in over 63 deaths, 631 or more people still missing and the destruction of over 7,600 homes–as of the time of this blog post. What did PG&E do… or more accurately, what didn’t this utility do that contributed to the fire? The utility company neglected to clear trees that were interfering with lines, as required by law. Just fifteen minutes before the blaze erupted, PG&E reported a power outage on an electrical transmission line in the immediate vicinity of where the fire sparked. While PG&E evaluated whether to shut down power lines in the area, it neglected to do so. To literally add insult to injury, PG&E is grossly underinsured with approximately $1.4 billion for the pending fiscal year, while some estimates for the Camp Fire exceed $15 billion dollars,[iii] or more than ten times the available insurance coverage. Similarly, the massive Woolsey fire in Southern California was also apparently triggered by failure to clean up a contaminated utility subsite as previously contractually required. [iv] The fire reportedly began about 1000 yards away from the site of a 1959 partial nuclear meltdown of a reactor, on property located at Santa Susana Field Laboratory (SSFL or Rocketdyne). Two minutes before the Woolsey fire began, Southern California Edison reported an outage at its Chatsworth substation which is located at the SSFL complex, just a few hundred yards from the site of the previous partial nuclear meltdown. This substation was originally built to provide electricity from the reactor. Just last year, the U.S. Department of Energy, NASA and the Boeing Company signed binding agreements to clean up this contaminated SSFL site but never took any steps to do so. While the investigation is ongoing, some maintain that the “Woolsey Fire likely released and spread radiological and chemical contamination that was in SSFL’s soil and vegetation via smoke and ash,” according to Dr. Bob Dodge, president of Physicians for Social Responsibility-Los Angeles. While all wildfire smoke can be hazardous, independent testing and air monitoring is pending to prove whether the Woolsey fire released radiation and other hazardous chemicals into the air, contributing to the fire as well as increasing risks to the public from toxic air contamination. Given predictions for continuing Santa Ana winds and more fires in California’s future, the worst is yet to come. Unless the utility companies who contribute to devastating fires are held accountable to the families who lost lives and homes, there is no incentive for the utilities to change their ways. 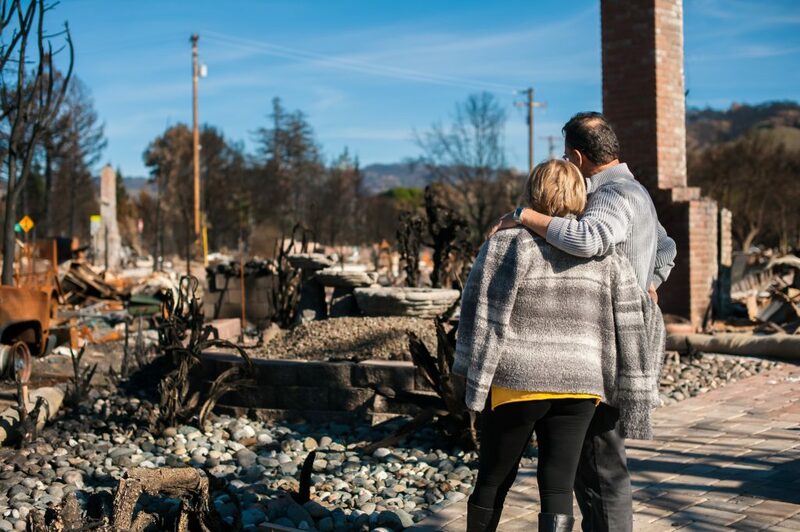 If you have been affected by the California wildfires, read more HERE on how we can help.